Microsoft Office 2016 has officially launched and if you have plan to explore in depth about features and tools of Office 2016 generally that slightly different layout compared to its previous iterations. Now, Microsoft has provide Office 2016 Quick Start Guides for both newcomers and veterans who want to learn more about the advanced features and functionalities of Office 2016 including Office 2016 for PCs, Office 2016 for Mac, and Office 2016 Mobile. With this guides, Microsoft not only cover the Office 2016 but also Office 2016 Mobile that arrival on tablets and Windows 10 Mobile devices (currently in preview). This PDF guides are in PDF form though Sway versions which free and available for all Office application such as Microsoft Word 2016, Excel 2016, PowerPoint 2016, OneNote 2016, and Outlook 2016, while Office 2016 Mobile only Word Mobile, Excel Mobile, PowerPoint Mobile, or OneNote. Each of Quick Start Guides provides helpful information that you can read, print out or share to other. 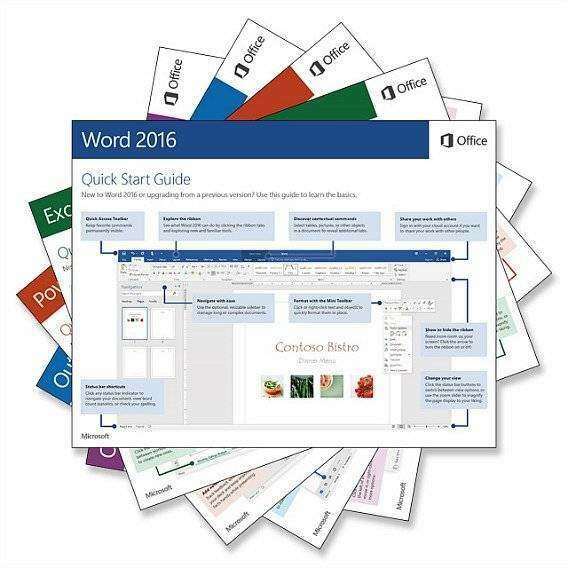 To get the Office 2016 Quick Start Guides, just visit the links below and download the ones you want or get the entire set for your preferred operating systems. Note: For Windows 10, click the “Download PDF” links to view, zoom, or print Quick Start Guides without any additional software. While older versions of Windows, you may need to first download and install the free Adobe Acrobat Reader DC software.